Aunt Jen's Sponge Cake 2 eggs - separate egg & beat well 1 cup sugar put half in bowls and beat [text covered by newspaper clipping re recipe for corn balls] yolks all together & beat. 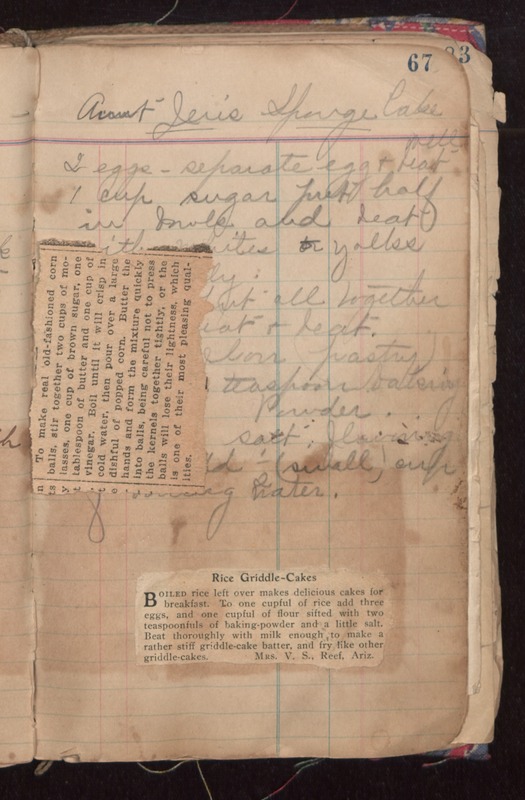 flour (pastry) teaspoon baking Powder salt, flavoring 1/2 (small) cup water To make real old-fashioned corn ball, stir together two cups of molasses, one cup of brown sugar, one tablespoon of butter and one cup of vinegar. Boil until it will crisp in cold water, then pour over a large dishful of popped corn. Butter the hands and form the mixture quickly into balls, being careful not to press the kernels together tightly, or the balls will lose their lightness, which is one of the most pleasing qualities. Rice Griddle-Cakes Boiled rice left over makes delicious cakes for breakfast. To one cupful of rice add three eggs, and one cupful of flour sifted with two teaspoonfuls of baking-powder and a little salt. Beat thoroughly with milk enough to make a rather stiff griddle-cake batter, and fry like other griddle-cakes. Mrs. V. S., Reef, Ariz.